My PED335 class have been training towards a half marathon which they will be completing 7 days from now. In our theory lessons last week, we discussed the role of tapering when faced with an important competition or event.To avoid the natural teenage response to the definition “the practice of reducing exercise in the days just before an important competition” of ceasing to do any activity at all, I focused on volume vs intensity. We discussed the need to ensure that while we decreased our volume, we were still training at the correct intensity. This led to discussions about training zones, before shifting to heart rate. 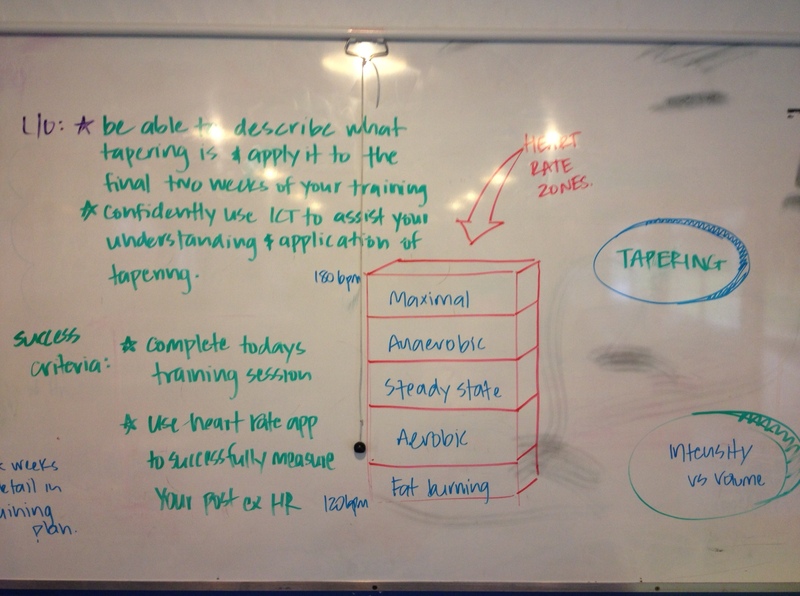 At which point I asked students to determine what heart rate they feel they should be training at this week. I provided a relatively easy interval session on a slight gradient and staircase close to the school and asked them to determine their effort based on what intensity they felt they should be training at. Upon completion of the session they quickly accessed my iPhone to measure their post exercise heart rate using “Heart Rate Free”. The session was relatively stress free. I did let everybody test run the app before the session to ensure they understood how it worked. It couldn’t pick up a pulse for one or two students, but they just did their heart rate manually (everyone actually did this to compare the accuracy of the app, to be honest the results were pretty darn close overall). We are about to start a run module with year 11 this term and so this is going to be really useful. There areloads of these types of apps available on android devices also.